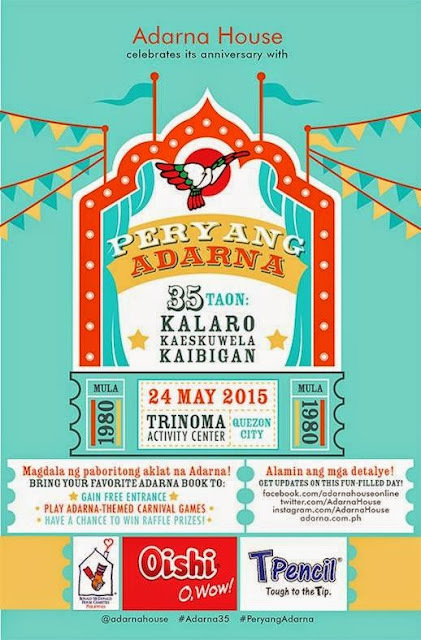 Children’s publishing company Adarna House invites families to help celebrate its 35th year anniversary with “Peryang Adarna,” a whole-day carnival-themed event slated for Sunday, 24 May 2015, at Trinoma Activity Center, Trinoma Mall, Quezon City. Peryang Adarna features game and activity booths that take inspiration from Filipino games like piko, tumbang preso, and tirador; and Adarna House’s well-loved titles like “Si Pilandok at ang Manok na Nangingitlog ng Ginto”, “100 Questions Filipino Kids Ask” and “Tiktaktok at Pikpakbum”. A short program will be held at 3PM, hosted by celebrity mom, Camille Prats. Dance numbers by Movement Studio, musical performance by Pundaquit Virtuosi headed by Julliard-trained Coke Bolipata, plus book readings by Luisito “Kuya Bodjie” Pascua and Earle Figuracion will entertain the families. New books to add to Adarna House’s over 500 titles will also be launched. Their writers and illustrators will be around to conduct book signing after the program. As literature evolves online, Adarna House will formally present on that day its newest venture, Adarna Digital. Its recently developed apps based on their popular books for a new generation of Filipinos around the world to enjoy. Admission to the event is free. To enter, an accompanied child must present any Adarna published book at the ticket booth.